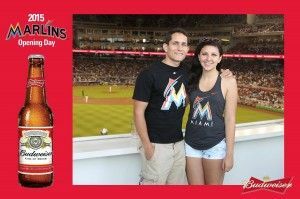 TapSnap 1029 at opening day for the Miami Marlins. As April started, we were finishing up at the Nightclub & Bar Show in Las Vegas. We're very excited about the new products we unveiled during the show; read all about them here. TapSnap was featured on TV Shows Dr. Phil and The Doctors. Watch the stars talk about TapSnap in these two Youtube clips. Bud Light's #UpForWhatever event at the San Antonio Alamodome for the USA vs Mexico soccer friendly was a blast, and TapSnap 1061 got it all on camera. Check out the photos here. TapSnap 1012 was at Fiesta Broadway in LA to help Montejo with their #VivaMontejo campaign. Check out the pics here. Here in Vancouver we were fortunate enough to be able to support a great cause alongside the city's biggest pro sports franchise at the Canucks Autism Network Family Festival 2015. Former Vancouver Canucks stars Kirk McLean and Trevor Linden were at the event, and Kirk even stopped to take a few photos with TapSnap Vancouver. Check out the album here. Event season is really kicking off, and our franchisees are booking lots of graduations and weddings. Just to name a couple, TapSnap Philly was at Wharton (an Ivy League Business School at the University of Pennsylvania) for their Senior Reception, and TapSnap 1026 snapped photos at this fun poolside wedding reception. 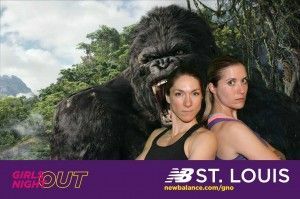 TapSnap 1149 at New Balance's Girls Night Out in St. Louis. New Balance's Girls Night Out, an event designed to connect women and support them achieving their health and fitness goals, took place at multiple locations across the US. TapSnap 1022 snapped photos at their Boston event at the end of March, and in April the fun continued in St. Louis with TapSnap 1149 and in NYC with TapSnap 1008. TapSnap added to its pro sports résumé with multiple events for the Charlotte Hornets (TapSnap Charlotte) and opening day photos for the Miami Marlins (TapSnap 1029). Major sports franchises love TapSnap's ability to both entertain their guests and spread their brand across social media. All the way over in the United Arab Emirates, TapSnap UAE snapped photos of all the costumed convention-goers at the Middle East Film & Comic Con. Check out all the albums here. All that and much, much more in only 30 days? Who knows what May will bring — it has 31. As the weather warms up and more events start taking place outdoors, who knows what kind of great venues TapSnap will show up at next month? Stay tuned to our Facebook page and our blog to find out.